Austria holidays, Salzburg, Kaprun, Zell am See and so much more: Cycling in Austria - Pedalling through enchanting valleys! Bikers galore! Cycling in Austria - Pedalling through enchanting valleys! Bikers galore! Contrary to some expectations Austria is a great country for cycling. well defined linking routes, fantastic scenery,with a superb interconnected cycle network, which is being extended year on year. With mile upon mile of routes off the main roads, with stunning views, with the opportunity to stop sand take a lift up a cable car, or have a swim in a lake, or visit a spa / sauna to work on any aches and pains. Complemented by fantastic food and a beer or two to help you on your way. It is also a nation of civilized car drivers with quiet roads. It is also easy to get around, with some excellent maps and good signposting en-route. It is also possible to put your bike on a train. The Austrian railway network ORB even indicate by means of a cycle symbol which trains can take cycles, and which ones to avoid. So for those that don't like the mountain climbs on their bikes, it is certainly possible to use the train to get to the head of the valley and cycle back down the easy way. Brian Wasson's excellent website gives a fantastic overview on getting around Austria, Germany and the Czech Republic by train with a bike. Bents Tours is worth looking at if you want to go on a cycling holiday in Germany, Austria, Czech Republic and Switzerland they also organize walking holidays in addition. 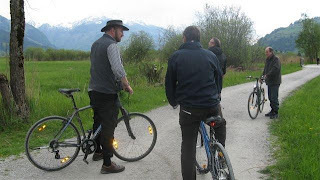 Other cycle friendly accommodation in Austria can be found on the Cycle People website, which a a great site to carry out pre-holiday research. 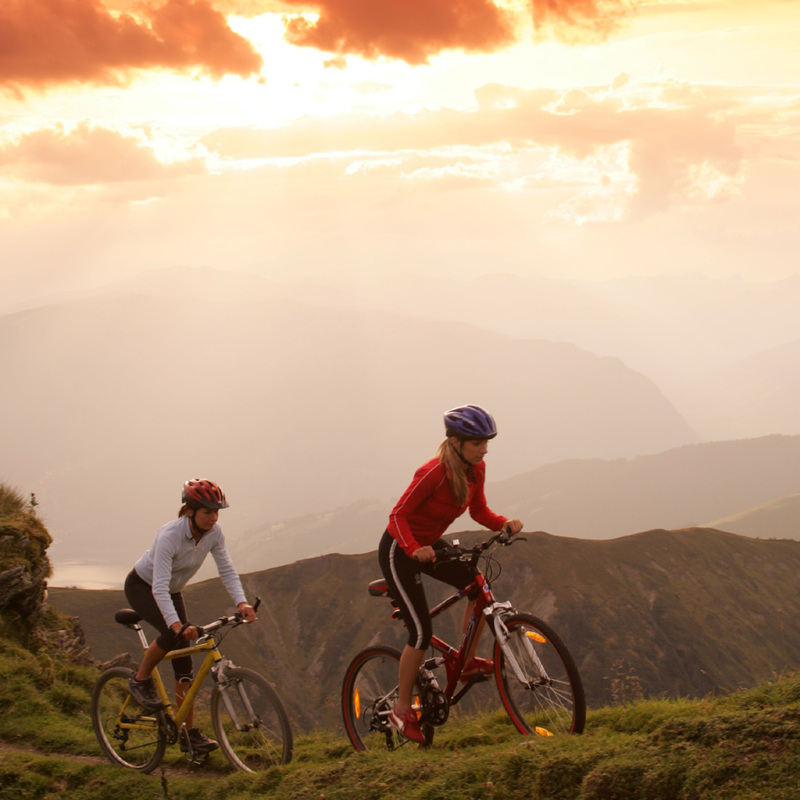 The Zell am See and the Kaprun tourist board provide a useful website on cycling in the area , the following useful information has been extracted from that site. Cycling in Austria on top of the world!! Over recent years, Austria has made a massive investment in bicycle paths opening up new routes and challenges. Now there are around 10,000 km (6,212 miles) of marked bicycle trails throughout the country. 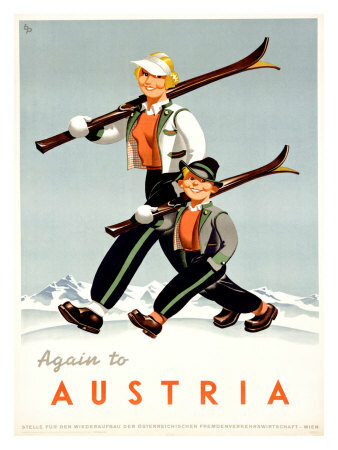 By using the Austrian Federal Railways makes it easy to ride from place to place, getting back to your base with out double backing. In the Austria many hotels and guest houses are more than happy to accommodate bikers these offer a variety of services such as special meals geared to cyclists needs. Most bike hotels can arrange for customers to be picked up or dropped off and perhaps the luggage being moved onto another establishment. 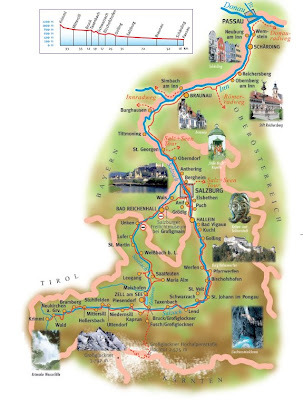 There are many routes in Austria but a recognized long distance route, which runs through the Salzburg state, is the Tauern Bike path which starts at the famous Krimml falls well worth a visit in Hohe Tauern national park, which is the largest nature reserve in the European Alps. From their it follows the valley down past Kaprun and Zell am See following the course of the Salzach river, down onto Salzburg abnd then onto Passau, it is a superb route and has the added benefit of being predominately downhill, starting at a altitude of around 1200 metres dropping down to around 200 metres over a 310 KM (around 175 miles), with scope to extend the route, approximately two thirds of the route is on paved surfaces, and it is more suited to mountain bikes. For further information please see the http://www.tauernradweg.com/ website or another article covering cycling the Tauern Cycle route can be found by clicking on the link. A wonderful tool to record your cycling journeys to share with others is www.bikemap.net click on the map, and there are loads of suggestions for routes to take with a commentary. There are plenty of other cycle routes in and around for you to discover for yourself, with plenty of places to hire your bikes also. The cycle festival "Bike Infection" takes place annually in August, this year it is taking place again in Kaprun to find out about the altitude attack, and to follow the route click on the link to find out about the rate of climb, or visit the Bike infection website, videohttp://www.mountainbike-kaprun.com/ showing the cycle route up to the the Kitzsteinhorn glacier ski lift, quite a climb. Kaprun has been host to the host to the World Cup biking downhill event, since then there has been development of routes in and around the area. Bike parks such as in Leogang & Wagrain have become very popular popular. Kaprun location at the junction of 5 valleys and on the Tauern cycle route, makes it very well placed to optimizes route choice depending on your groups ability. In Kaprun and Zell am See there are a number of shops that hire bike and will service them also, mountain bikes from Graviti hire is one of those shops, with knowledgeable staff and experienced technicians. it sleeps from 3-9, and is in Kaprun on the Tauern Cycle route, with cycle hire shops. The apartment is very close to the start of the extensive Tauern valley cycle routes, so there many routes to choose from close by, with the added benefit of secure overnight storage for bikes in the basement. How much might you expect to pay for a week's bicycle hire? See attached link for prices, depends upon the equipment, helmets, numbers in group, you normally can get 10% off advertised prices if you ask. But a cost of 65 Euro for a week is about right. I attach a few more prices for information. (Prices from 2008 are subject to change and given for guidance only). For the adrenlin junkies you can, be taken to the top of a 2000 metres high mountain cycle down it, then for lunch go white water rafting, followed by canyoning, walking up a river the wrong way. And perhaps after tea have a swim in the lake at Zell am See currently at 18.5 centegrade. 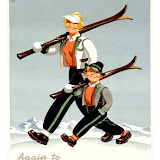 You may have wait for the following morning to have a ski on the Kitzsteinhorn glacier, followed by a game of golf on the 36 hole championship golf courtse of Kaprun and Zell am See. Thanks for the information, that all sounds very exciting - you are certainly blessed with a great choice of activities!